Join the descendants of Finnish immigrants and North American natives on a bittersweet journey through the mines, casinos, and reservations of Finndian country. At the turn of the 20th century, tens of thousands of emigrants left Finland in hopes of a better life in North America. Scraping together a living in the old country had been hard, but bliss didn’t necessarily await in the new homeland, either: much like today, recent immigrants had to struggle against the prejudices of the majority. But there was work to be found in the mines and the forests, where the Finns gradually forged bonds with the members of the hard-pressed Ojibwe tribe. The two groups shared an intimacy with nature and a similar view of the world. The depth of their coexistence is best illustrated by the fact that their joint descendants came to be known as Finndians. The gorgeously illustrated In the Land of the Finndians, a brilliant blend of fact and fiction, opens up a poignant vista into the lives of this forgotten people. 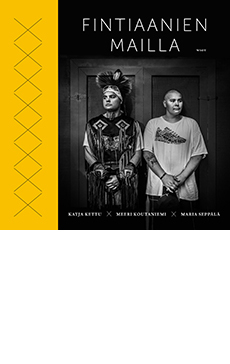 In the Land of the Finndians is a unique collaboration of Katja Kettu, a best-selling author, Meeri Koutaniemi, a top photographer, and Maria Seppälä, a seasoned documentary filmmaker. A documentary film on Finndians made by the talented trio In the Land of the Finndians will air in the Finnish TV in April 2019.